Video claiming to show a Syrian boy rescuing a girl amid heavy gunfire lauded as heroic chronicle of resistance now revealed as 100% fraud – filmed in Malta. Just one of many lies perpetuated by Western media. Image: One must wonder just what else has been peddled before the public by the Western media as authentic or “believed to be” authentic, when in reality being a complete, 100% fraudulent production. More than 11,000 children have died in war-torn Syria since 2011, including hundreds targeted by snipers, a report by the London-based Oxford Research group revealed earlier this month. The group found that sniper fire killed 389 Syrian children under the age of 17 between March 2011 and August 2013. The UN has previously accused the Syrian regime of “crimes against humanity” – including the use of snipers against small children. Nowhere does the Telegraph claim “experts” of any kind believed the video was authentic. 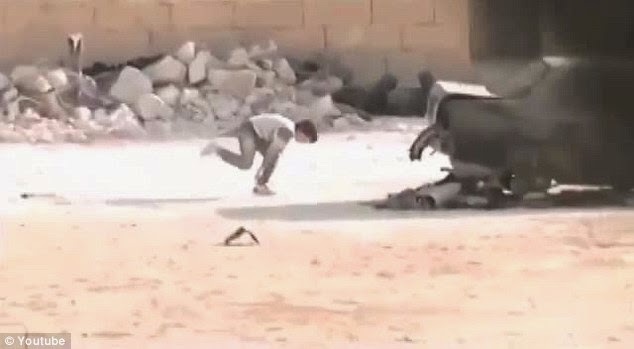 Instead, what the Telegraph did was engage in the same intentionally misleading, manipulative propaganda much of the Western media has resorted to in its coverage of the Syrian conflict, and many others, for years – cite a baseless, unverified claim – then roll it in together with other baseless claims so that they appear to support one another as factual. While the Daily Mail claims “experts” claimed “they have no reason to doubt its authenticity,” those who have witnessed the West’s intentional, systematic deceit throughout the duration of the Syrian conflict could cite many reasons. With it now confirmed that the above mentioned video is a hoax, yet another reason still can be cited. Lars Klevberg, 34, from Oslo, devised the hoax after watching news coverage of the troubles in Syria. He told BBC Trending: “If I could make a film and pretend it was real, people would share it and react with hope. “We shot it in Malta in May this year on a set that was used for other famous movies like Troy and Gladiator. Klevberg admits that “Syrian refugees living in Malta” participated in his propaganda stunt. This is far from the first time the West and its proxies have been caught blatantly producing false reports, footage, and claims regarding the Syrian conflict. In fact, the Western media’s coverage of the Syrian conflict is nothing more than a series of deceptions crutching their way along on their audience’s perceived ignorance, from one exposed sham to another. In this video Luke Rudkowski talks about a fake viral video that was produced by a NATO country to be used as propaganda.